It was a 2-0 mini-sweep yesterday for our leans. The exhausted Flames managed just 1 goal to go well under their 2.5 Team Total, and the Stars scored in the final minute of regulation to cover the +0.5 puck line against the Blues. Much busier night today with 11 games on the NHL schedule! We’ve got thoughts on all of them below, beginning with our favourite bet of the day: the Predators/Avalanche Over 5. We posted a couple of articles to our site yesterday that you might want to check out, both of them about home ice advantage in the NHL. The first compares NHL home ice advantage to home field/court advantage in other sports, and looks at stats over the past 5 years to determine how much home ice advantage is worth to the moneyline. The second article analyzes all 30 teams’ home/away records over the past 5 seasons and identifies which teams have the best home ice advantage in the NHL (we were surprised with what we found), as well as which team has actually been worse at home than on the road during that time. We’re hoping to post quite a few more articles to our site in the upcoming months. 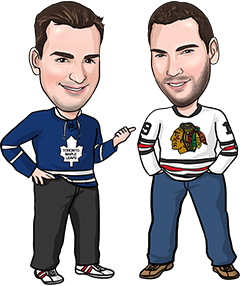 If there are any NHL betting topics you’d like to see covered, please don’t hesitate to let us know. You can message us on Twitter or Facebook, or shoot us an email to editor@NHLTips.ca. The Predators were blanked 3-0 Sunday in Winnipeg, but it wasn’t for lack of trying. Nashville blistered the Jets net with 42 shots, continuing to play strong offensive hockey. Before that loss in Winnipeg, the Preds had scored 5 goals in 4 of their previous 7 outings. In their last 10 games, Nashville has scored 3 goals or more 7 times. Colorado had an awful offensive slump earlier this month but they seem to be out of it now, scoring 17 goals in their last 6 games. Their defence has been better lately (2 regulation time goals or less against in 6 of their last 8) but they’ve had trouble containing the Nashville offence in recent meetings, allowing 20 goals to the Predators in the last 5 matchups. We definitely like the chances of one of these two teams getting to 3 goals tonight, and think it’s quite possible that they both do. Reasons to bet Carolina: The Hurricanes have won 6 of their last 8, including a come-from-behind 3-2 win over Florida Sunday at home. New York has lost 4 straight home games. Reasons to bet New York: The Rangers are still 8-4-0-1 at home on the season while Carolina is 3-5-3-1 on the road. New York has won 22 of its last 28 home games against the Canes. Reasons to bet Tampa: Lightning should bring good focus for this game, having lost 3 of their last 4 and looking to avenge 5-3 loss to Columbus last week in Tampa Bay. Reasons to bet Columbus: The Blue Jackets have won 7 of their last 9 home games and earned points in 7 of their last 8 games overall. Tampa’s been outscored 7-2 in its last 2 road games. Reasons to bet Boston: The Bruins snapped a 3-game losing streak Sunday with a 4-1 win over Tampa and have held opponents to 2 goals or less in 7 of their last 9 games. Reasons to bet Philadelphia: The Flyers beat Calgary 5-3 Sunday at home and have registered 85 shots on net in their last 2 games. Boston is playing its 4th game in 6 days. Reasons to bet Buffalo: The Sabres have earned points in 6 of their 11 road games and should be energized by the return of Jack Eichel. Ottawa is playing its 4th game in 6 days. Reasons to bet Ottawa: The Senators have won 4 straight games and earned points in 8 of their last 10. Buffalo has been held to 1 goal or less in 7 of its last 10 games. Reasons to bet Dallas: The Stars have earned points in 8 of their last 10 games, including a come-from-behind 4-3 OT loss last night in St. Louis. Detroit has lost 7 of its last 8 home games. Reasons to bet Detroit: The Red Wings have earned points in 3 straight games (2-0-1) and outshot their last 2 opponents 66-43. Dallas has dropped 8 of its last 10 road games. Reasons to bet New Jersey: The Devils have earned points in 3 straight games, averaging 4 goals per contest during that span. Winnipeg was outshot 42-24 in Sunday’s 3-0 win over Nashville that snapped a 5-game losing streak. Reasons to bet Winnipeg: The Jets have won 4 straight at home while the Devils are 3-6-3 on the road. New Jersey’s been gashed for 4+ goals against in each of its last 5 games. Reasons to bet Florida: The Panthers are playing their first game since head coach Gerard Gallant was fired Sunday. Chicago could be flat in its first home game following a 7-game road trip, and Jonathan Toews is still out with injury. Reasons to bet Chicago: The Blackhawks are 8-1-1-1 at home and Florida is 4-6-0-1 on the road. The Panthers are playing their 3rd game in 4 nights. Reasons to bet Toronto: The Leafs beat Washington 4-2 Saturday and have scored 4+ goals in 6 of their last 10 games. Edmonton has lost back-to-back games to Arizona. Reasons to bet Edmonton: The Oilers have allowed just 9 regulation time goals in their last 5 games. The young Leafs have just 1 road win this year (1-5-2-2). Reasons to bet Minnesota: The Wild has earned 6 points in its last 4 games and scored 12 goals in its last 3. Minnesota has won 8 of its last 11 meetings with the Canucks. Reasons to bet Vancouver: The Canucks are 6-4-1 at home and 5-3-1 in their last 9 games overall. Minnesota has 4 wins in 11 road games (4-4-2-1). Reasons to bet Montreal: The Canadiens have won 3 of 4 games and have allowed 18 regulation time goals in their last 10 contests. Ducks have lost their last 3 games at home. Reasons to bet Anaheim: The Ducks snapped a 3-game losing streak with an impressive 3-2 win Saturday in San Jose. Montreal’s just 3-3-1 in its last 7 games and 4-3-0-1 on the road. Reasons to bet Arizona: The Coyotes have been a much better defensive team since goalie Mike Smith returned from injury, allowing just 14 regulation time goals in their last 7 games. Arizona has won 2 straight and is 3-1-2 in its last 5. Reasons to bet San Jose: The Sharks are 7-3 at home this season and should be hungry to avenge a pair of 3-2 losses in Arizona earlier this month. The Coyotes are 3-6-2 on the road.